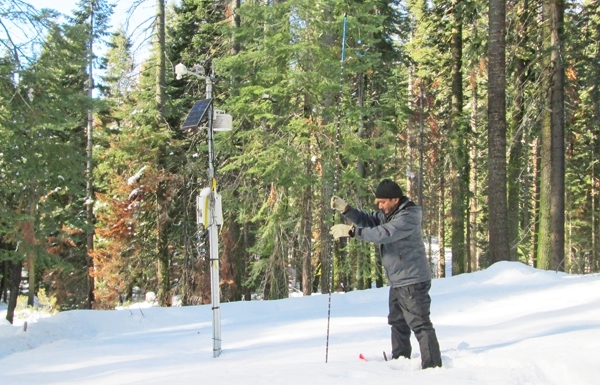 Dr. Safeeq measures snow depth at the Kings River Experimental Watersheds site in the Southern Sierra Nevada. Photo by Michelle Gilmore. California's recent drought was the worst in memory. However, in a relatively quick turnaround, this year the state's water infrastructure is full and water managers are battling the wettest winter on record in quite some time. Now, by many accounts, the drought is over for much of the state. The uniquely wet winter of 2016-2017 has highlighted a key issue surrounding our surface and ground water storage infrastructure: We could have stored this abundant water, not in new reservoirs, but right under our feet. 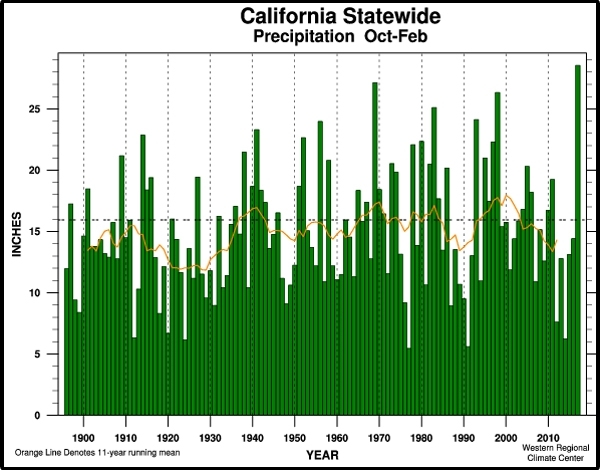 The cycles of drought and flood will continue in California; in order to survive the droughts we have to move winter precipitation to groundwater storage in greater quantity and more efficiently. From Oct. 2016- Feb. 2017, the statewide precipitation total was 28.5 inches. At 180% above average, this year ranked first of the 122-year period of record. In the San Joaquin and Tulare Lake region, the amount of precipitation was greater than the statewide average, but not enough to break records. Just as spring is showing bluer skies, and we have a handle on local flooding, there's yet more water to come from the mountains. 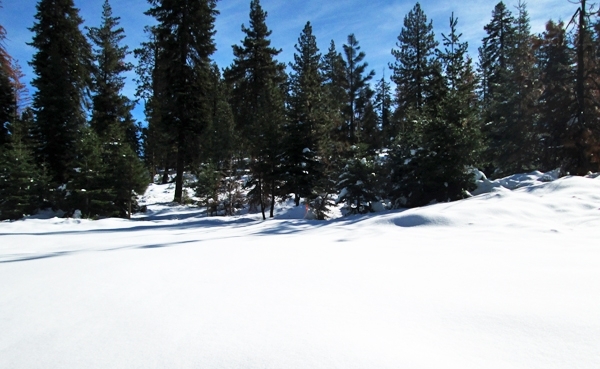 After five years of thin and, in some cases, non-existent snow cover, the California Department of Water Resources snow survey data shows nearly 47 inches of snow water equivalent. That is, there's nearly four feet of water sitting on top of the Sierras ready to melt and fill our rivers, reservoirs, floodplains, and where possible, percolate into underground aquifers. Snowpack at the beginning of the rainy season (November, 28, 2016) at the Southern Sierra Critical Zone Observatory. Photo by M Safeeq. At the beginning of the calendar year, as heavy precipitation continued, reservoir managers started holding back and reserving water behind dams, uncertain how much precipitation we might get through the rest of the rainy season. But the heavy rain and snow turned out to be overwhelming, and reservoirs were near capacity by mid-February, losing the ability to further store runoff and mitigate for floods. In other words, there is a limit to how much water we can store behind these dams. On the other hand, the amount of groundwater storage potential (between 850-1300 million acre feet) in California dwarfs our current surface water storage capacity (42 million acre feet). Unfortunately, with some inspiring exceptions, California does not typically manage or store surface water and groundwater conjunctively. But with patterns like a long drought followed by an extremely wet winter, we have the opportunity to prepare groundwater storage infrastructure that will help us to take excess surface water and store it in aquifers. With Sierra Nevada sensor networks and remote sensing, we can account for how much water is available in snow, how much water should be stored as groundwater, and how much can be safely stored in reservoirs. With sites like the Southern Sierra Critical Zone Observatory on the Kings River and San Joaquin River watershed, and its expansion to UC Water'sAmerican River Hydrological Observatory, we can measure in near-real-time how much water is in the Sierra Nevada and model the timing of its arrival to streams and reservoirs. This year we largely missed the groundwater storage opportunity, especially for basins battling with overdraft issues. If we focus on groundwater storage potential now, we could be ready for the next very wet winter when it comes. Dr. Safeeq is a Research Scientist with Sierra Nevada Research Institute, University of California, Merced and Investigator with the UC Water Security and Sustainability Research Initiative. Follow him on Twitter @safeeqkhan @ucwater, and keep up to date with California's weather patterns through a free service, the California Climate Tracker.